"All waveforms, no matter what you scribble or observe in the universe, are actually just the sum of simple sinusoids of different frequencies." DFT is too slow compared to FFT. My lcd spectum analyzer doesn't need a great speed like that of an FFT, now if it is capable of providing a speed of around 30 frame/second, then it is more than enough for visualizing the audio spectrum on an LCD. But any way, in my case I can roughly achieve around 100 frames/second(any way it is too high refresh rate for a 16x2 lcd, not recommended also :-)). My audio sampling rate is 20KHz for 32 point DFT. Since the transform result is symmetric, I need to use only the first half, ie the first 16 results. So, it means, it can display upto 10KHz spectrum. So the resolution is 10KHz/16 = 625Hz. I have tried to improve the speed of DFT computation. If it is an N point DFT, it needs to find (N^2)/2 sin and cos values. For a 32 point DFT, it needs to find 512 sine and cosine. Before finding the sine and cosine, we need to find the angle(degree) which takes some processor time, so I implemented a lookup table for that. Next two tables are for sine and cosine. I didn't used any float or double since it takes more processing time in 8 bit avr, instead I implemented the sine and cosine lookups as 16bit intiger, by multiplying the real sine and cosine values by 10000. Then after finding the transform, finally I need to divide each result by 10000. This eliminates the need of using float or double and makes it more faster. Now I can calculate 120 32-point DFT operation/sec which is more than enough for my small spectrum analyzer. Now, looking towards the LCD side, I utilized the custom character feature of LCD to make 8 stacked horizontal bars which takes the entire 64bytes of the LCD RAM for custom character bitmap. I ones seen a video is hackaday.com that a person used a 16x2 lcd in the similar manner for his spectrum analyser. So I also adopted the same idea of using the custom character for my spectrometer. Now one of the most important part of this stuff is the audio sampling via an eletret microphone. Special care must be given while designing the pre-amp for the mic. 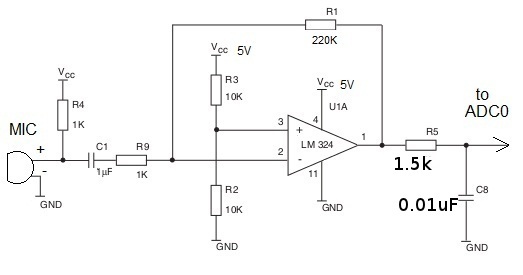 We need to set the zero-level of the ADC input to exactly half of the ADC reference voltage ie to 2.5v. Now it can have positive and negative swing on this 2.5v level according to the input audio signal but it should not cross the limit ie the amplifier gain should be properly adjusted to prevent clipping. I am using an LM324 op-amp for the mic pre-amp to meet the above conditions. To compile it using avr-gcc in linux, check my previous post (atmega32 based wav player), there I have explained it in detail. Can you tell how much percent of memory you used and how much still available? Wouldn't it be faster if you multiply the sin and cos values by a power of 2, instead of 10000? That way multiplying and dividing is only a matter of shifting. 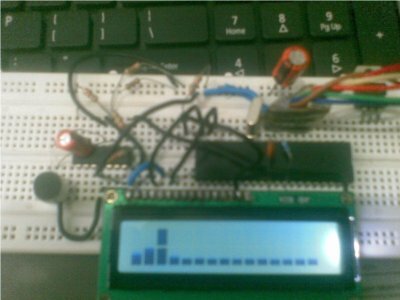 Do you happen to have an Arduino PDE sketch for the code ? Actually I told it is 9710bytes with optimization -O3 in avr-gcc. Why did you put a low pass filter (with a cutoff frequency of 2.821 kHz) between the opamp and the ADC? Are the values for R5 and C8 correct in the schematic? The video clearly showed it was sensitive to frequencies greater than 3k. 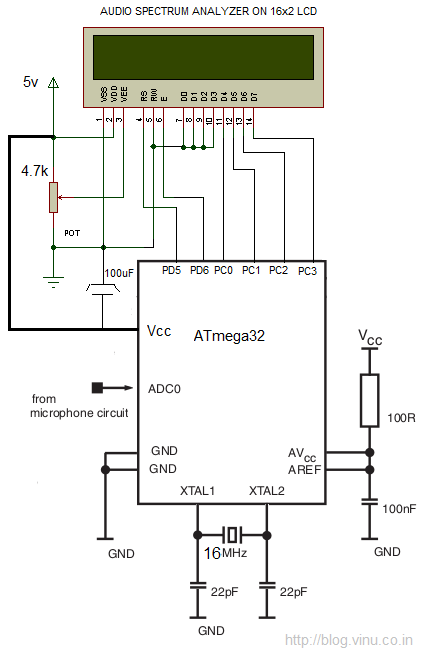 Actually that mic pre-amp schematic is copied from my previous post, so I forgot to change the design there. But here, I didn't used it while testing... (We can use .01 uF and 1.5K here) I will update that schematic soon..
how about , if i do it by 16f877a ??? P/s : my english is not good . Great Work, but a question: You choose to use Mega32 because of bigger SRAM size or it is possible to run the program on smaller AVRs like Mega8? In PICF877a, I believe there is no hardware multiplier. If I am right, then it will be little more slow in PIC16f877a. RAM will not be a problem here. Possible chance is a fash overflow. But still I think it will not overflow since atmega8 have 8KB flash. Can I replace the 16MHz crystal with the smaller one? Does it affect the calculation & result? Please reply.. Turns out that you swapped PD5 and PD6 on your schematics. PD5 should go to E and PD6 should go to RS. Ooops...Actually it was a drawing mistake....;).. I was wondering... How can I increase the microphone sensitivity, which resistor(s) should I fiddle with ? i am a 3rd year btech student and i liked this project of yours very much..
please could you tell me the code which you have given above..in which compiler should i run it..because running it in C is not successful due to header files and libraries not available in C..
"avr-objcopy: 'instrue.elf': No such file"
instrue is the name of project and c file..
do i need to connect my hardware and MCU to build it?? and do i have to header files or there are some pre added files to the project?? Ok, now that you've got avr-gcc on your computer (AVR Studio installed it) it may be simpler to build the project using the command line. First take the Makefile from the atmega32 based wav player project that's somewhere on this website then copy it next to your .c .h files and modify it to work with these sources. Make sure that the "make" command is in your PATH environment variable. In a DOS prompt cd to your source folder. type "make" and it should build the .hex to flash onto your AVR chip. If you have avr-studio in your windows, then just copy the two files to the build environment (I am not much familiar with avr-studio gui app). Then a simple build will give the hex I guess... Just modify the compiler optimization to -O3, it will be there in build properties. in linux may be u need to create a udev rule for usbasp otherwise need to add a sudo infront of avr-dude . ie "sudo avrdude --------"
Started a new project..added a new file to the project under source files..copied the C code to it..
Then added lookup.h under libraries..
have no idea what it means..
@goebish : i am not able to find the make file.. Forget about AVR studio, I don't use it a lot neither (only when I need to debug with my AVR Dragon). Use the command line (just make sure your environment variables are OK for avr-gcc). You can do just as Vinod explained and you won't require a Makefile, or you can get the AVR wav player Makefile there: http://bit.ly/OTrtQt ,it works with this project too. I can't find the post that you explain how to compile it into atmega32. Can you explain it again or send us the page? how can i link my pc to the atmega? You are using external voltage reference for ADC, but adc_init() in source code sets this to internal 2.56V. Hello, I would like to know how you calculated table values ​​of angles. I know sixteen frequency bands that form the spectrum and the amplitude of each frequency band is given by the sum of 32 words, then the table must have 512-degree terms. However, I did not understand how the values ​​were obtained. What IDE did you use? Was it CodeVision AVR? What is the Vcc value ? Sir, I downloaded the program into ATMEGA16 but the LCD didn't show anything. What was the problem? Please, help me. Thx. Try keeping the pins D0,D1,D2 and D3 open by removing the connection from GND. The library lookup.h in that webside alot much more than that you post above.?? i wonder if the longer one is the better? Beside that. i found hex file in that webside. Can i use that file too? may i swap pd5 and pd6 when use that. and i set JTAGEN to 1 to be able to access port C is it Right? Other bits are set default. Am i Right? please help me. I'm desperate for the circuit to run. Can I use audio input from mobile phone instead of mic? For that you can remove R4 and mic. And connect audio signal across the capacitor and gnd. But one issue is, audio signal from mobile phone audio socket is more powerful than mic signal, so in this case you have to reduce the gain of amplifier by reducing value of R1 and increasing value of R9, you may need to play with it. what will be the changes for 20*4 LCD? What will the changes for 20*4 lcd? can i compile the source code with codevision or bascom or etc? How do I enter the library "lookup.h" to this project code in Atmel studio? Characteristically of much code shared on the internet, the documentation is lacking and renders it difficult to port to another platform. For an explanation of how this works, the sine and cosine tables are generated by computing the functions over 360 points form 0 to 2 PI. The degree lookup table was generated deg[j+k*N] = (int) (2*pi*j*k/N) module 2*pi) where j covers the range of 0 to N-1 and k ranges from 0 to N/2 -1. The "k" for loop is the outside loop. The degree lookup table generates an index used in the sine and cosine tables. Since the Fu array elements are accumulators and hence the TRANSFORM code above should initialize the Fu arrays upon entry. Hey. And how can you determine the frequency peaks? cc1.exe: error: unrecognized command line option "-mmcu=atmega32"
Your blog is very interesting. Thanks for sharing nice information.